Dragon Boat festival is coming again. 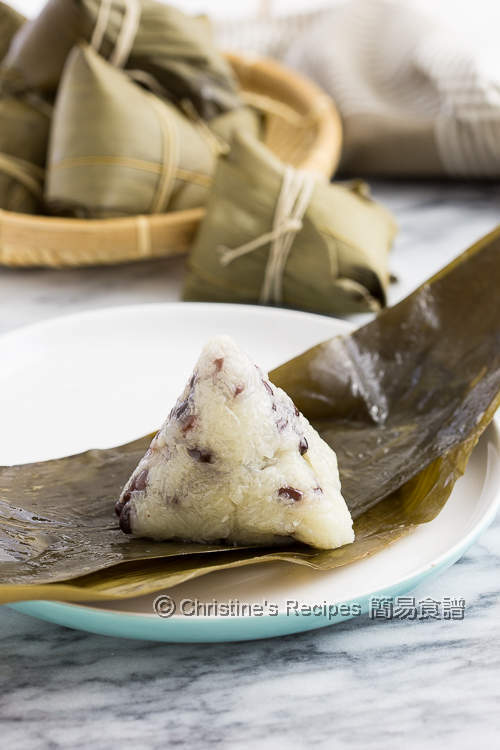 It's time to enjoy eating zongzi (aka glutinous rice dumpling/sticky rice dumpling). This traditional Chinese food can be eaten all year round though. I made some with savoury fillings. They were nice and hot from my large pot. To better use the large pot of hot water, I made some more with sweet fillings —— red bean paste. Who doesn’t like snacks with red bean paste? To get a more attractive looking for these dumplings, I mixed some soaked red beans with the sticky rice. The red bean paste filling was homemade, so the sweetness was just right to my family’s taste. You can use any brand of your favourite store-bought product for convenience. 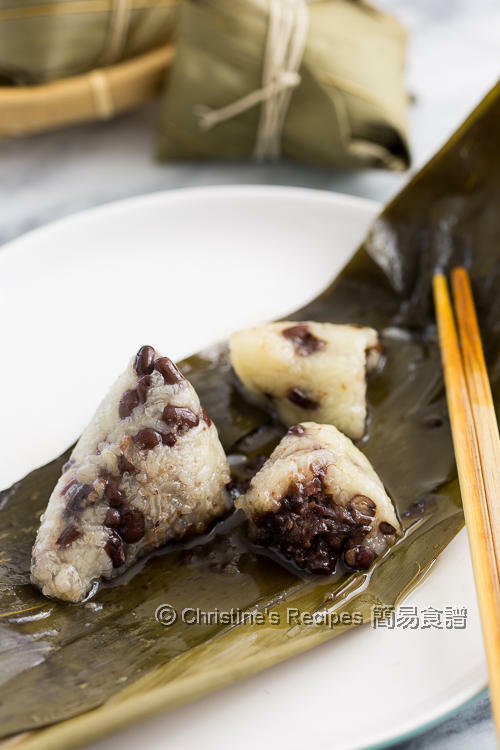 These red bean sticky rice dumplings are not too big. I could finish one by myself in one go. The honey drizzled on top is optional, but highly recommended, as it’ll make the dumplings smell so fragrant and addictively tasty. The sticky rice dumplings are best served hot. 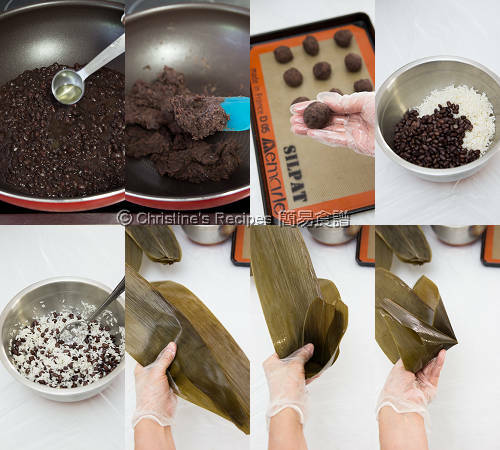 Follow the instructions of cleaning and preparing the bamboo leaves in this Cantonese sticky rice dumplings recipe (please see method 2). Rinse the red beans. Soak in water overnight. Rinse and drain well. Put into a pot and cover with water at least 3-cm /1-inch height. Bring it to boil over high heat. Reduce heat to medium and continue to cook for about 20 minutes. Turn off the heat. Don’t remove the pot lid. Let the red beans sit in the pot and cook in the residue heat for 30 minutes. Drain out the red beans. Set aside. Rinse the glutinous rice and soak in water for an hour. Drain well. Mix with marinade for about 20 minutes. Combine the cooked red beans with the sticky rice. 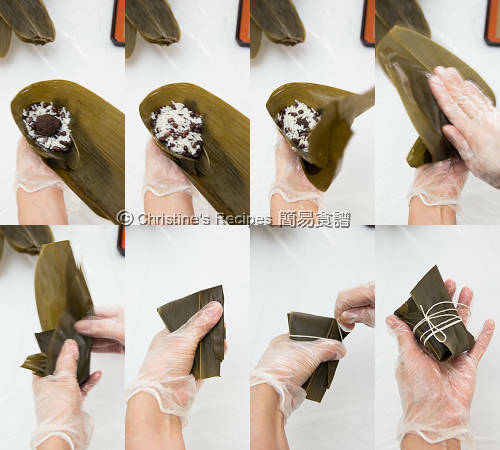 Divide the red bean paste into 8 equal portions and roll each into a ball shape. Layer two leaves, smooth side up, sliding out one-third of its edge of the bottom one and fold to form a cone. Place 2 tablespoons of glutinous rice and red bean mixture. 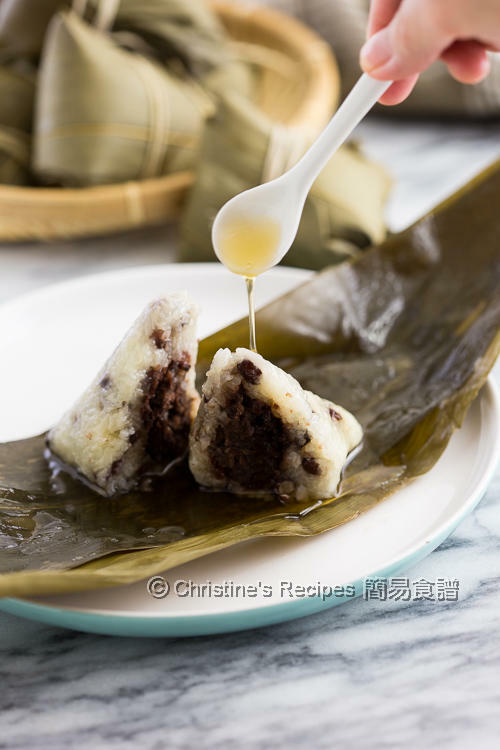 Put a red bean paste ball in the middle, cover the top with 2 tablespoons of rice and bean mixture. Fold the leave and seal the dumpling on top. Use kitchen string to wrap tightly around the dumpling. Repeat this step to finish wrapping the rest of the dumplings. Place the dumplings in a large pot. Pour in boiling water to cover all the dumplings. Cook over high-medium heat for 2½ hours. Serve hot with honey or maple syrup if desired. Enjoy! If you have a thermal cooker, you can draw it out for use, as it’s a good helper to save energy. Simply bring the water to boil in the inner pot after putting the dumplings in, then continue to cook for 5 minutes. Place the pot into the outer container, cover for about 1½ hours. Then remove the pot from the container and cook over high heat until it boils again. Place it back into the container for 1½ hours. The dumplings will be very tender. Try to prepare more bamboo leaves than you need as some might be torn or broken for some reason. Don’t panic if you find a leaf is torn. You can add another one on top to help seal the dumpling. Can this be steamed without the bamboo leaves.? Good question. I guess you can, although I haven't tried steaming. Use a mould to steam. That's a good wish. Welcome you to come and visit me. You can have as many as you like. Yes, red bean can go with other savoury ingredients very well. Very nice version from your grandma, very homey and tasty too. I haven't tried this recipe with a pressure cooker. So no record of cooking time.